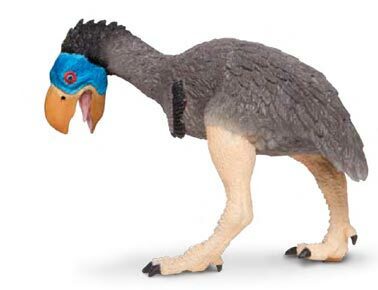 One of the new additions to the diverse range of prehistoric animal models offered by Safari Ltd in their Wild Safari, Dinos and Prehistoric Life model series is an exciting replica of the “Terror Bird” known as Gastornis. This American based manufacturer of figures and models has built up a very strong reputation for the quality of their creations and this new model of a giant, flightless bird is no exception. The genus of flightless birds ascribed to Gastornis have fossils that date from the Late Palaeocene Epoch to the Late Eocene (58 to 41 million years ago). During this period in Earth’s history, the mammals may have radiated and diversified, but in many habitats the largest terrestrial creatures were giant, flightless birds. Some specimens of Gastornis for example, may have exceeded more than two metres in height. Fossil remains found in Europe, notably France and Germany indicate a robust, heavy bird with relatively short legs. The Safari Ltd replica has the head bent down and forward somewhat, as if this prehistoric creature was about to grab some unsuspecting Creodont (an extinct Order of mammals). Model of a giant, flightless bird but was it a predator? The broad beak is beautifully painted and the design team have made sure to include lots of detail around the mouth, including the creature’s pink tongue. Having the bird posed with its beak open permits this detail to be shown, but in real life most birds don’t wander round with their mouths open. Ironically, a significant proportion of prehistoric animal replicas are posed with their mouth’s wide open, one of the unusual aspects of model collecting when comparing figures to extant creatures. The paintwork on the model shows the usual care and attention with the striking, almost metallic blue of the skull contrasting well with the dark overtones of the bird’s plumage. It was particularly pleasing to note that the feathers immediately behind the head have been painted a much darker colour than the rest of the body. Many birds, such as those of the Crane family (Gastornis may be related to Cranes), show variation in feather colouration around the back of the head and neck. With many living species of birds that show this trait, the colouration differences are used in courtship displays, perhaps the giant Gastornis had an intricate and graceful courtship, unfortunately, since this genus of prehistoric bird has no near extant relatives this can only be speculated upon. The model is supplied with a clear plastic stand that can be used to support the figure if needed. As with all bipedal models it can be quite tricky sculpting a replica that remains stable even on a deep pile carpet. Individual feathers can be picked out, a nice touch, they give the impression of a shaggy, feathery coat, but the feathers seem more asymmetrical in shape when compared to the bristle-like feathers of modern-day flightless birds such as the Kiwi and Rhea. Vivid paintwork on the back of the skull. The tiny wings are very well depicted and each wing has a black margin of feathers running along the rearward edge, the wings are vestigial, the likes of Gastornis evolving into a cursorial animal, a creature of the hot and humid tropical forests that stretched around the world during the early Cenozoic. Scientists remain uncertain as to the diet of this particular “Terror Bird”. Academics studying fossils in the 19th and 20th Centuries were broadly in agreement that this four hundred kilogramme bird must have been carnivorous. Biomechanical studies carried out on the beak and the skull suggested that this creature had a bone-crushing bite. However, more recent studies have suggested that the lack of talons on the feet and relatively slow running speed of this bird may indicate a herbivorous or omnivorous diet. For example, the huge beak with its immense rostrum would have made a very effective nut cracker. Perhaps, this giant of the Palaeocene/Eocene fed on seeds and nuts with the odd small mammal or lizard thrown in for good measure. Growing up it was often confusing when it came to this particular flightless bird. In some textbooks, it was referred to as Gastornis, whilst in others it was named as Diatryma. The first fossils ascribed to either genus were scientifically described in 1855 and the species G. parisiensis was erected. The species name refers to the fact that the first Gastornis fossils were discovered near Paris. In 1876, the famous American palaeontologist Edward Drinker Cope named and described a new type of giant, flightless bird from fossils found in the western United States. The genus of Diatryma came into being. In the late 19th Century and into the 20th Century more fossils of Gastornis/Diatryma were found and it was discovered that the fossilised bones were very similar anatomically. So similar that in fact the fossils of birds known as Diatryma could just as well be ascribed to the Gastornis genus. As the name Gastornis was established first, it is regarded as the senior synonym of Diatryma. Scientists still debate whether the fossils from the United States are sufficiently different from those found in Europe to allow a distinct genus (Diatryma) to be validated. These flightless birds, predatory or not could be regarded as the very last descendants of the Theropod dinosaurs to hold a position amongst the megafauna in terrestrial habitats. As the Palaeocene ended and the Eocene started mammals had begun to take over the dominate ecosystems. 1.75 to 2 metres tall. It is was a pleasure to see a Gastornis added to the Wild Safari Dinos model collection. The figure measures a fraction under eleven centimetres in length, so it represents something like a 1:15 scale replica of the extinct bird. This model will no doubt, prove popular with dinosaur model collectors and those enthusiasts who prefer to collect more unusual prehistoric animal figures.